Shop for authentic Uganda Flags. We offer indoor and outdoor Uganda flags in durable nylon. Our outdoor flags are finished with a canvas heading, while indoor flags are finished with a lined pole hem and your choice of with or without fringe. We also offer indoor and outdoor Uganda flag sets. 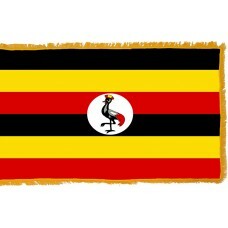 The Uganda flag features six horizontal bands in the colors of black, yellow, red, black, yellow, and red. In the center of the red and black bands (the 3rd and 4th) is a disc with the national symbol, which is a grey crowned crane with a raised leg. The black color represents the African people, the yellow color represents the sunshine of Uganda as well as the happiness and good fortune, and the red color represents the African "brotherhood." Red is the color of blood that connects the people as well as symbolizing the energy and passion of the Uganda people and nation. The grey crowned crane is considered to be a bird with a peaceful and gentle nature which represents the people of Uganda and their nature. The raised leg of the crane symbolizes the country moving forward. The grey crane was also used as the military band of the Uganda soldiers whilst they were under British rule. The Uganda flag was adopted on October 9th, 1962, when Uganda gained independence from the United Kingdom and it is the only flag in the world that consists of five colors. Uganda is a country in East Africa that shares borders with Kenya, Rwanda, Tanzania, the Democratic Republic of Congo, and South Sudan. The largest and capital city of Uganda is called Kampala. Uganda has eight major rivers (including the River Nile) and five major lakes (including Lake Victoria) and one fifth of the country is covered by water. It is thought to be the youngest country in the world due to the fact that approximately 50% of the population is under the age of 14 and it is one of the poorest countries in the world. It is also the most corrupt country in Africa and home to around 500,000 refugees and asylum seekers. Uganda is often referred to as the “Pearl of Africa” and was given this title by Winston Churchill due to how beautiful he thought the country was when he visited whilst it was under British Rule. British explorers came to Uganda in the 1860s to try and find the source of the Nile and in 1894, the country became a British Protectorate until its independence in 1962. The economy in Uganda is mainly dependent on agriculture with coffee and cotton making the majority of the income. It is one of the ten biggest coffee producers in the world. Uganda is also visited by approximately 800,000 tourists a year, with the main tourist attraction being the Mountain Gorillas. These gorillas are an endangered species with only 750 left in the world and the majority are found here and in the national parks. The main national park in Uganda and the most visited is the "Queen Elizabeth National Park." Uganda is also home to 1,060 species of bird (11% of the world's bird population) and is often visited by birdwatchers. Another popular destination is the "Bethel Church" which is one of the smallest churches in the world and is located in Nebbi town on top of Biku Hill. The church can only accommodate three people at one time. The "Uganda National Mosque" that is located in the capital, Kapala, is a sky-scraper mosque that can accommodate 15,000 worshippers as well as 1,100 in the gallery.